Scare up some fun with our unique Halloween Candy Bar Wrappers! Sweeten your party with our fun and festive Halloween Candy Bar Favors! Great for school Halloween parties, to hand out at your Haunted House, Company Halloween parties, or just to hand out to your friends. Halloween is such a fun Holiday for both kids and adults! Our Halloween Candy Bars will put a smile on everyone's face. With our one of a kind unique designs, you can't go wrong. Your child will be the hit of their School Halloween Party when they hand out these festive Halloween Candy Bars! Our designs are current and fresh and there is a theme for everyone. From spooky and scary, to cute and adorable, we are sure you will find the perfect Halloween Candy Bar Wrapper for your Halloween Party! Have your own theme in mind? 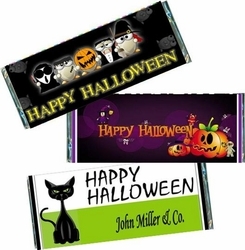 Let us know and we can work with you to create a unique and custom Halloween candy bar wrapper just for you! We offer FREE Foil Sheets, FREE Custom Design, FREE Proofs emailed directly to you for you to approve, and will Personalize your Halloween Wrapper FREE! We will add a photo, company logo or name also FREE! Order the WRAPPERS ONLY for a DIY candy bar favor. We provide the SILVER FOIL underlay FREE to go along with your PERSONALIZED WRAPPERS! *This is a DIY. We do NOT provide the candy bars!! *Our wrapper/foil combo will fit 1.55 oz "Regular" Size Hershey's bars, and Kit Kat bars! *Assembly is required by customer *To sum it up: YOU buy the chocolate bars, YOU wrap the candy bars with silver foil provided then wrap with your personalized wrapper. Order the fully WRAPPED CANDY BARS. We will do the work for you! Your Halloween Candy Bars will arrive to you all ready to hand out to your guests. If you would like to use a photo design, please send image & order number to info@candyundercover.com.